It is our last evening on Maui. I’m a bit bloody, bruised, and battered from kayaking in the ocean in the cove outside Sugi’s aunt’s house. More about that soon. Nonetheless, it has been a lovely trip and I’d like to share some pictures with you. We arrived in Maui last Thursday. Andy and Sugi’s wedding was Sunday afternoon and in lieu of a rehearsal dinner on Saturday, Sugi’s family invited the out of town guests to their oceanfront home in Pa’ia, on the north shore of the island. The family compound, which is where Sugi’s grandfather Ohata originally had his medical clinic and home, faces onto Pa’ia Bay with a view of Kahalui and the ‘Ioa Valley in the distance. Pardon my clumsy stitching in the above photo. At least, you have an idea of how spectacular the view from their backyard is. There were at least thirty guests from out of town. With Sugi’s more immediate local family members, the crowd was close to fifty. One of the first orders of business was to rehearse the wedding ceremony, which the celebrants did on the lawn. While everyone practiced, I shot some pictures, including this cute three-year old who is the daughter of Andy and Sugi’s friend Linda, who was also the wedding’s photographer. June, being the daughter of a photographer, was ready to strike a pose on request. The sun was still strong at this point in the afternoon – going on 6:00 – so Tawn was seeking whatever shade he could find. After the rehearsal, the tiki torches were lit and the luau began. Above, Tawn poses with the bride and groom to be, Sugi and Andy. 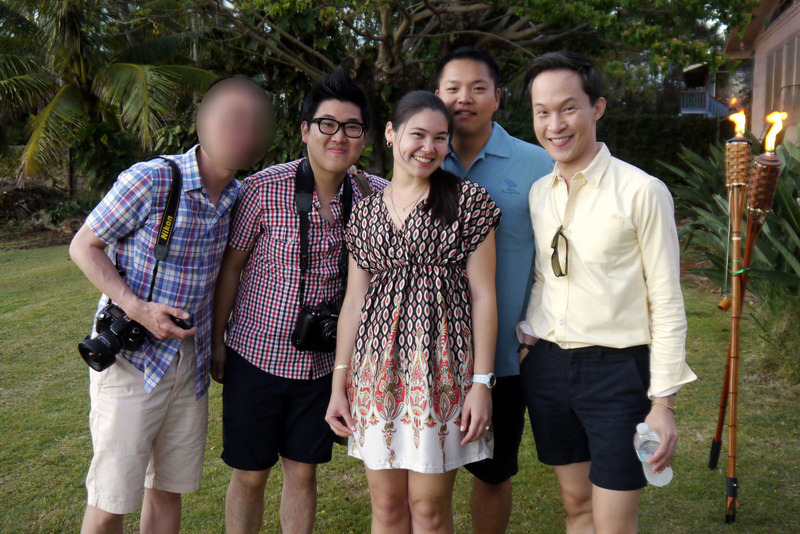 To their left are another pair of Xanga friends, Andy (ungrandvoyage) on the far left and Kenny (kenpcho) second from the left. Andy has always kept his identity hidden on Xanga (sound familiar, Matt?) so he asks that we obscure his face when posting pictures that include him. Tawn and I have met Kenny a few times before but this was our first time meeting Andy. Several adorable children running around. In addition to the photogenic June (center) we have Sugi’s niece Taylor on the left and Andy’s nephew Cayden on the right. I enjoy watching children interact, especially young children as they can so easily play together and so easily ignore each other. Another shot of the children, who were helping Sugi’s youngest niece, Malia (in the yellow outfit), as she wobbled around the yard. We also met Sugi’s college roommate Amaka and her adorable baby Chinasa. Chinasa was so cute because she was totally willing to be held by one stranger after another without fuss, but she looked at each one of us with this poker face, as if she was trying to size us up without revealing her feelings. As the sun set over west Maui, the photographer has Sugi and Andy pose for some photos. 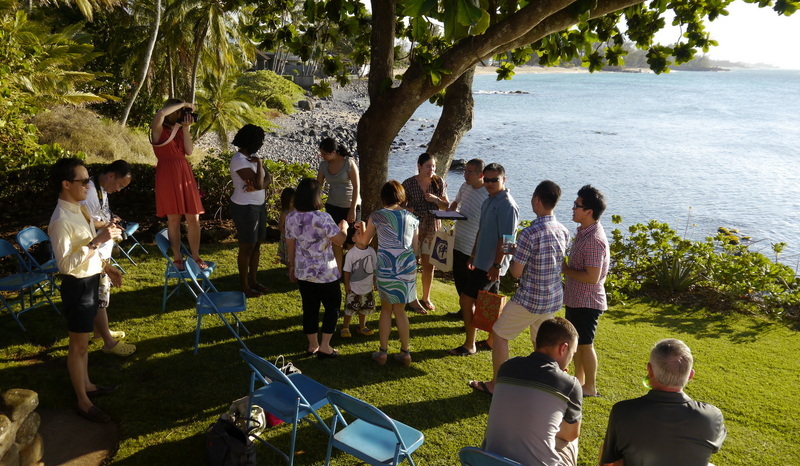 While the sunset was subdued that evening, the pictures turned out well and – most importantly – we had a very Hawaiian welcome that made all of the guests feel very much a part of the family. 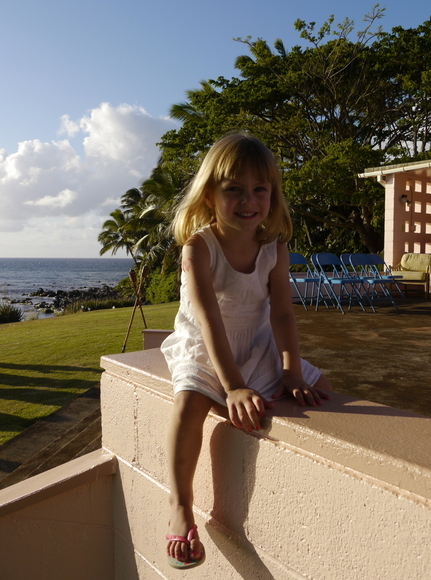 This entry was posted in Uncategorized and tagged Andy, Hawaii, Maui, Paia, Sugi, wedding by christao408. Bookmark the permalink. hawaii is ALWAYS the place to be. there is something about the beach, the sunset, the tropical trees, etc, that just relax you. especially love the fact there are no people/vendors going after you trying to sell stuff, like in Bali. do the beaches/islands in thailand give the same sense of relaxation? Wow. What a blessing to be there. Maui is one of my favorite places on earth! Wonderful photos Chris. The compound is wonderful and the people look so happy. Thanks for sharing! Very nice “stitching” job, Chris. The scene is gorgeous, especially the last photo! Looking forward to the wedding as well as the “bloody and bruised” entries! Wow – when I first saw the pictures, I thought that must have been in a resort. I remember Andy posting pictures from the home before. I love the shots of the kids. As for me in pictures… I would be so tense and jumpy if I was there… so many cameras! Gorgeous, that is quite a dream backyard! andy and Sugi are nice looking couple, congratulations. . by the way, i need to mention that Tawn is stuningly good looking, hehe. Look foward to more blogs. Me too I can’t wait!I didn’t take any photos during the “events” so thanks for taking and posting them! @ElusiveWords – Seriously million dollar view… Just love it! @stevew918 – Thanks Steve and yes, Tawn ALWAYS looks so nice!!! Oh my goodness – what a stunning location!! The children’s facial expressions are cute. I can’t remember the last time I interacted with children – I’m actually looking forward to the day I have a niece or nephew haha. @stepaside_loser – I really enjoy interacting with children and tend to gravitate towards them. They are generally less pretentious than adults. @agmhkg – Oh, you guys and your fear of the sun! =P@fauquet – Thanks for your comment Michael. It was an interesting transition from hot Thailand to “relatively cool” Maui! @stevew918 – Thanks, Steve. I have lots more to share from the trip. @ElusiveWords – You might be tense and jumpy regardless of the cameras – just out of fear that Andy would do something inappropriate. @CurryPuffy – Andy shot the photos (safely from the shoreline) of me kayaking and dumping into the ocean several times. Will be sure to share those with you soon! @awoolham – It is a beautiful island, although I think I like Kauai a little better just because it is greener and more lush. @rudyhou – Haven’t been on the Thailand beaches a whole lot but there are numerous vendors there. Thankfully, their wares are limited to things like coconuts and food!